If you're at all like me and totally fed up of winter, with no sign of spring in sight, then hopefully the card I've got for you today will help brighten your day. I love both the gorgeous wrapped tulips image in the Love Is Kindness stamp set from Stampin' Up! and the sentiment, but to get more use out of them I very, VERY carefully cut the sentiment from the image when I initially mounted the stamp onto the wooden block. Stamp the image in Jet Black StazOn onto Watercolor Paper and allow to dry for a few moments. Squeeze the Melon Mambo and Pear Pizzazz ink pads before opening so ink transfers into the lid (or use Reinkers). Paint the image with the transferred ink and the Aqua Painters. Attach one 4 3/4" square of Best Year Ever DSP to the 5" Crisp Cantaloupe Square and the other to the inside of the base card. Attach square to base by adding adhesive to the second smaller panel. Trim the image piece to desired size (mine is 2 3/4" x 3 3/4"), layer onto Crisp Cantaloupe piece and pop up onto the base using Stampin' Dimensionals. Stamp the sentiment from Bloom With Hope in Melon Mambo ink onto a snippet of Watercolor paper. Punch with the Scallop Oval and layer onto a Crisp Cantaloupe punched Decorative Label. 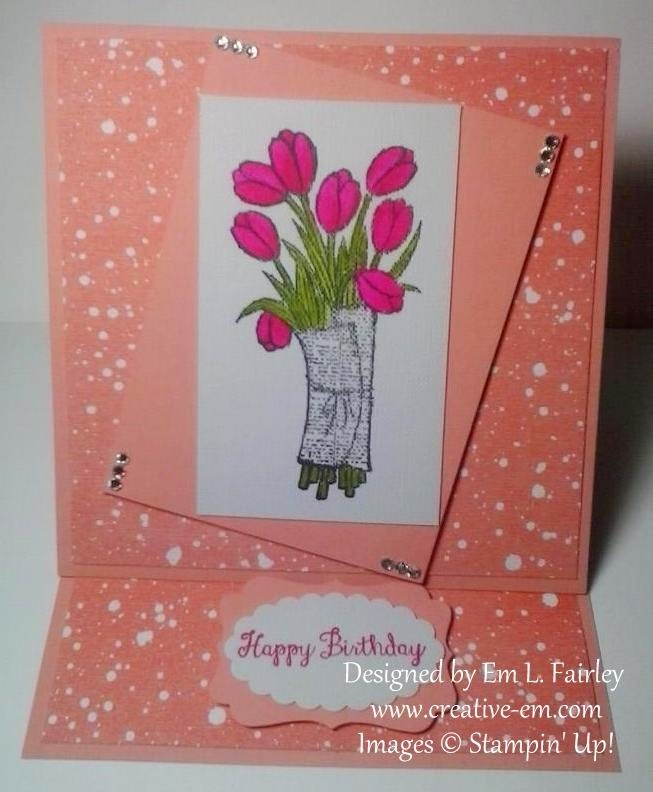 Pop the sentiment onto the inside of the card with Stampin' Dimensionals to create the stopper for the easel. If you've not tried this type of card before, although it sounds complicated, it really is easy. I love tulips, this is gorgeous! Your card is SO CUTE! Thanks for playing with us this week at Can You Case It?! Super cute, love the easel idea! Thanks for joining us at CYCI. Oh I love tulips! This is a beautiful card Em. Thank you so much for entering our ATG challenge at Through The Craft Room Door this fortnight. I hope you will join us again next week. Very nice work! Thank you for joining us at CYCI! such a pretty card. Thanks for sharing it with us this week at CYCI? I am so tired of this cold weather. Pretty! Thanks for joining us at CYCI! Love this card. Cute card!! I love the easel layout!! Such a pretty card. 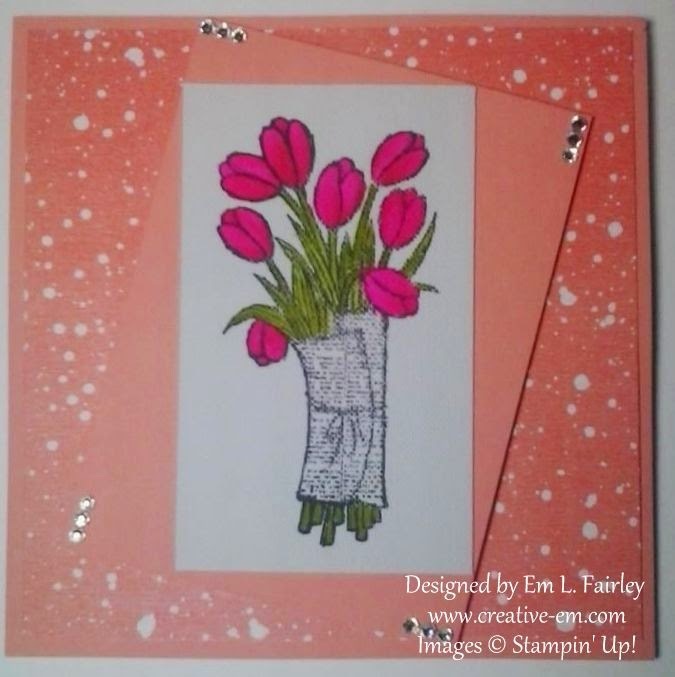 This tulip stamp is great and your coloring is wonderful. Thanks for playing along with us on the Can You Case It blog!